At Milam Chiropractic & Sports Therapy, we welcome patients from Santa Ana and Tustin who feel back pain and want to try natural relief. We provide effective treatment of mid back pain including pain between the shoulder blades using holistic methods of wellness care. Mid Back Pain in Irvine: What are the Causes & Symptoms? Pain, stiffness, and soreness are main symptoms of back pain. If your mid back loses mobility, it can feel difficult to lift things, move in certain ways, or perform activities you used to do. When you feel pain or tightness, chiropractic adjustments can help. There are many causes of back pain. Our Irvine chiropractor has seen an increase of patients coming in with forward head posture, which is due to hunching forward and staring at a screen all day. Since many people need to use a computer and smartphone for their jobs, we focus on realigning the neck and head and preventing further injury through ergonomics. Chiropractic care is an effective way to treat mid- back pain in Irvine. When you first see us, we will find the cause of your pain. We will evaluate your posture and ask where you feel pain. The mid-back region is the keystone of your spine, yet conventional medicine overlooks back pain and skeletal issues in this region. If your mid-back is not properly positioned and the spine cannot move freely, you will feel tension and pain. The only way to relieve this is to restore the spine's alignment with chiropractic. Since most patients come to us when they feel pain, we quickly focus on relieving your pain through chiropractic adjustments. It takes several adjustments to properly relieve your back pain, but many patients feel a direct reduction in pain and inflammation after our chiropractor's first adjustment. To speed up the pace of healing, we may bring in other therapies that complement chiropractic care. Our Irvine chiropractor uses massage, cold laser therapy, spine rehab, physical therapy, and custom orthotics to promote spine health and back pain relief. These therapies help us release muscle tension, so your back and spine can move freely. After we have relieved the pain, we will focus on stretching and strengthening the back. These are key to returning the back to a place of strength and avoiding future injuries. In this phase of treatment, our Irvine chiropractor will focus on those factors that contributed to your mid-back pain, including smartphone use and poor posture. 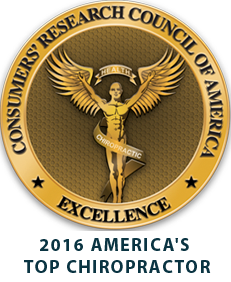 We want to educate you on how to avoid illness, pain, and disease by adopting good habits. With our help, you will learn how to take care of your neck and back and live in wellness, instead of pain. 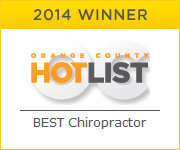 See Our Chiropractor in Irvine! Take the first step to cure your back pain by calling us today or emailing our chiropractor serving Irvine, Santa Ana, and Tustin. If you are a new patient, your initial consultation is FREE.